From the west (like LA) take I-210 E and exit Azusa Avenue Northbound. From the east (like the Inland Empire) take I-210 W and exit Azusa Avenue Northbound. 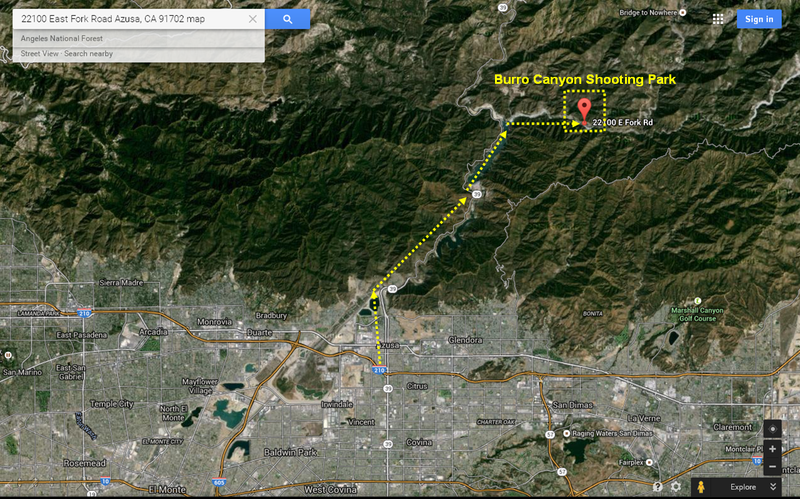 Take CA-39/North Azusa Avenue Northbound for approximately three miles where it eventually merges to become San Gabriel Canyon Road as you head upwards towards the mountains, the San Gabriel Dam and River will be on your right side as you head up. Sunday 7 April 2019: Cloudy. High of 840F. Always bring a hat, jacket, sunscreen and at least a gallon of water and/or sports drink for sun/heat mitigation. Bring Snacks/food. There is a burger and taco concession sometimes on the weekends. I will have a large community ice chest with ice for your convenience. 2. Evacuate casualties via our own privately designated vehicle. *For any first time customers please complete the Safety/Hold Harmless Agreement attached at the bottom of the LOI page and bring it to class to save time (live fire only). *A community ice chest will be available for your drinks. *All California DOJ laws apply however, I do not work for the DOJ nor do I have time to inspect everyone's equipment. Use what you think is appropriate. *If you are using a bullet button (BB) please have a plan on what tool or contrivance you will use to engage the BB. *A scarf or cloth to protect your neck may be wise to guard against hot brass. *It is a smart time saver to strip smaller boxes of ammo and dump them loose into a larger container. •	Reliable, proven service-type pistol or revolver. •	Rentals available, please ask. •	At least three (3) magazines but more recommended. •	Small bottle of lubricant and cleaning kit. •	Strong gun-specific belt unless holster is on your load bearing equipment. •	150 - 300 rounds of quality ammunition. •	Positive mental attitude and open mind to learn new things. •	Lunch, food, snacks: power bars, trail mix, etc. *Prerequisite: Pistol 101 or equivalent from another institution with skills test (see Pistol 101). •	Engage targets at close quarter (1 meter) contact from close retention position. •	Engage targets at close quarter (1 meter) contact from mid retention position. •	Reliable, proven semi-automatic pistol.